Desktop apps in Windows 10 always open with the desktop behind them. Most desktop apps don’t have the look or consistent functions of Windows 10 apps. Desktop apps may not respond to touch as reliably as Windows 10 apps. Open the Start screen: Click the Windows button in the lower-left corner of the desktop or press the Windows key. In the Search the Web and Windows box (you find it to the right of the Windows button), type calc (the first four letters of the word calculator). The Search panel appears on the left side of the screen, as shown. The Search panel lists app names, program names, settings, files, and web pages with the term you entered. 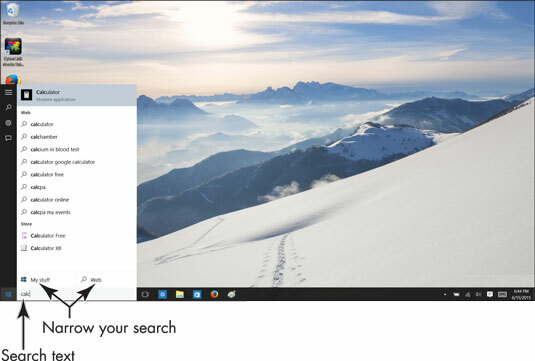 You can search for just about anything from the Search the Web and Windows box. Select My Stuff at the bottom of the Search panel to narrow your search to items on your computer; select Web to narrow your search to things on the Internet. Type ulator to finish typing the word calculator. The Search panel lists only items with the complete word calculator in them, including the Calculator app. Select the Calculator app to open it on the desktop, as shown. To perform a calculation, select the buttons on the screen or use a keyboard. Return to the Start screen: Click the Windows button in the lower-left corner of the desktop or press the Windows key. Type calculator again in the Search the Web and Windows box. Again, the Search panel appears, and the Calculator app appears at the top of the Search panel. 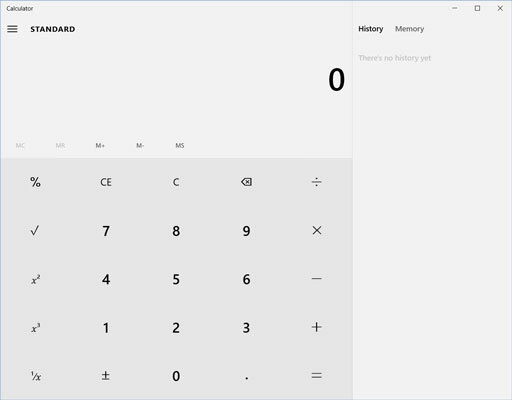 Display the context menu on the Calculator app and choose Pin to Start on the context menu. Mouse: Right-click Calculator in the Seach panel. Touchscreen: Touch and hold Calculator in the Search panel until the context menu appears, and then release your finger. Open the Start screen and note where the Calculator tile appears. You can open the Calculator by selecting this tile. To remove a tile from the Start screen, display its context menu and select Unpin from Start.